Special translucent versatile material that makes the image in the banner "luminescent." Banners are a great way to grab attention, but the durable vinyl can make it difficult to illuminate the custom banner during evening hours. Make the most out of your display with a backlit banner. These custom banners are made of thick backlit printing materials, but they reflect nearby light sources to ensure onlookers will be able to see the backlit posters from any direction. Typically used outdoors or on billboards, backlit banners give business owners the freedom to attract customers toward their storefront during all hours of the day. Through the support of BannerBuzz's high-quality backlit printing equipment, all backlit banners are beautifully made with additional capabilities. These custom banners can be used year-round because they are also weather-resistant. Maximize the use of your company's custom banner by properly taking care of the backlit printing product. Doing so will prevent your staff from having to buy another banner for five years. Backlit banners and backlit posters can be used to identify where a business is, provide directions, or promote special offers. 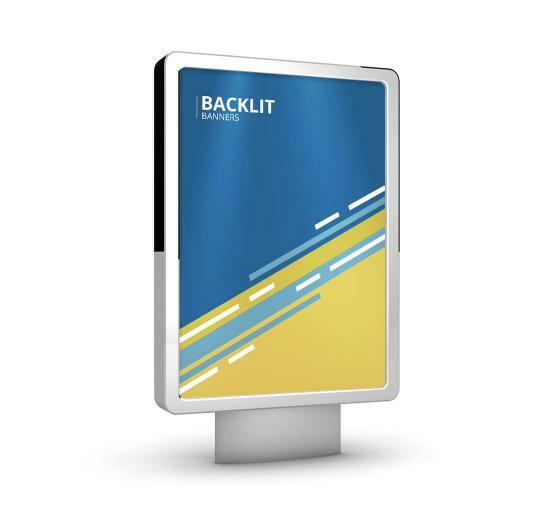 Businesses can choose from a template of backlit banners or make their own using BannerBuzz's web application. Interested in other backlit banners? Check out our backlit film printing services. Contact us with questions regarding backlit printing, a complementary art proof, or free shipping. BannerBuzz will respond to every inquiry because we want each customer who uses our services to be happy. Application:Indoor or outdoor sign and billboard applications, water proof and UV safe. Printing:Full Color, 720DPI, 1080DPI, Solvent Digital Printing, Eco Solvent. Note:Use Proper Light , color will appear darker in day time or without light. Maximum size available in 1pc is 120" x 145ft.